British canoeing runs Paddlesport Star tests and Paddlepower scheme. 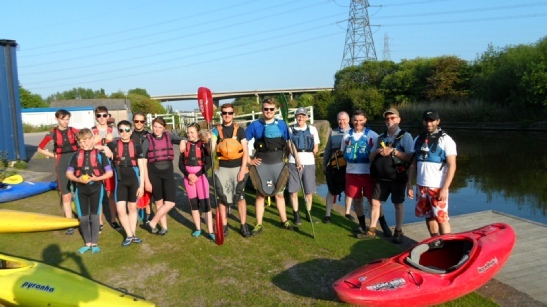 The Paddlepower scheme is aimed at under 14's. Star tests can be used over that age. We can test all the Paddlepower logbook based awards and the 1 to 2 star generic paddlesport tests plus the 3 star kayak award. The club can also provide the BCU Foundation Safety and Rescue Award (FSRA) see this link. Swim 50m and stay afloat for 5 minutes. Explain the safety rules that apply to boating, and the effects of winds, tide and current. Demonstrate the difference between a buoyancy aid and a life jacket and explain when each should be used and how they function. Show how they are worn. Row a dinghy single-handed and carry out basic manoeuvres. Scull a dinghy and carry out basic manoeuvres. Complete an introductory course for canoeing or kayaking. Crew a Bell Boat or Dragon Boat. Carry out an activity using knots, bends or hitches. Make a lashing and demonstrate rope whipping or safe sealing. Take part in a half-day expedition or exercise afloat. Complete four items from the list of nautical skills training activities each one taken from a different section of the list. Qualify for the British Canoe Union's Paddlepower Passport.